Why are 84% of Women Missing Out On Sports? Did you grow up playing sports? Maybe it was a gymnastics class on a Thursday night? Or little league baseball on a Sunday afternoon? I grew up playing sports and I LOVED it. Even when we didn’t get the win, I had a blast spending the day with an incredibly team. But having all these wonderful memories haven’t been an option for most Canadian women. 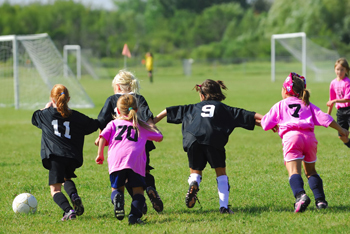 In a study conducted by Canada’s Dairy Farmers and Canadian Association for Advancement of Women and Sport and Physical Activity (CAAWS), entitled Women in Sport—Fuelling a Lifetime of Participation, they found that 84% of women are missing out on the benefits of sports. The representation of women in sport commonly centres around femininity, rather than highlighting their athletic accomplishments. The Fuelling Women Champions movement is campaigning to make sports accessible to girls and women nationwide! Hey Buddy!, I found this information for you: "Why are 84% of Women Missing Out On Sports?". Here is the website link: http://shesinfluential.com/2016/04/22/why-are-84-of-women-missing-out-on-sports/. Thank you.